This blog attempts to collate various materials in connection with the year 1735. How did Moravians end up in Georgia? Zinzendorf originally brokered land in Georgia for the Schwenkfelder (not Moravian) refugees living on his land near Berthelsdorf. When the Schwenkfelders were banished from Saxony in 1733, they asked Zinzendorf to help them relocate. They had heard of Governor James Oglethorpe’s plans to admit those fleeing religious persecution to the new colony of Georgia in America. Protestants were desired to form a buffer between the English colonies and Spanish Catholics from Florida and French-Catholics from Louisiana. With Zinzendorf’s help the Schwenkfelders travelled as far as Holland, but then accepted an offer for passage to Pennsylvania instead after hearing rumours of poor land and being turned into slaves by the English in Georgia. The Trustees of Georgia then allowed Moravians to take the land themselves, granting them 500 acres on the Ogeechee River, plus two 50-acre tracts in Savannah. 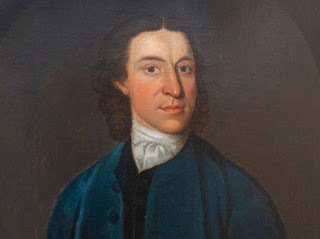 Zinzendorf capitalised on this change of events: “I therefore look into every opportunity which presents itself [to make Jesus known among the “heathen”]. The first group of ten men left London on February 3, 1735, and after nine weeks at sea arrived in the Savannah harbor on April 6. The company, led by Spangenberg, included masons, carpenters, weavers, a gardener and a game-keeper - all pious workmen skilled to establish an independent mission community in Georgia. The first year found the group preoccupied with survival rather than any true mission work. They spent much of their time surveying and cultivating their land and building shelter for themselves and the next expected company. Adjusting to the new climate and a poor diet was hard on the group and most fell ill, although only one, Friedrich Riedel, a mason, died that first year. Although a second group of 25 men and women arrived on February 23, 1736, “internal disputes” and political pressure to bear arms doomed the work to failure before much could be accomplished. 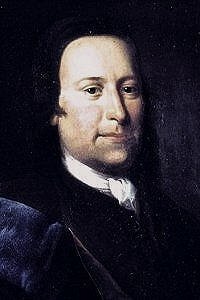 Peter Böhler later said, “the good children lost sight of their Plan.” Through death and abandonment the group dwindled to six by 1740, and impending war with the Spanish finally drove them to Pennsylvania, where mission work resumed - this time with much more success. ‘I felt at once an uncommon fear and dejection … through the strength of convictions and the fear of going to hell … I knew not any weight before like this.’ No amusement could lift the load. Getting away from the town for a walk in the country did no good, for even there ‘the terrors of the Lord came upon me, and the pains of hell took hold of me’. A light-hearted companion eased the burden, but only for a time, for when they separated, the burden returned. Mathematical calculations suggest that it is on 11 July 1735 that the dwarf planet Pluto moved inside the orbit of Neptune for the last time before 1979. Cassandra Willoughby, Duchess of Chandos (1670-1735) was an English historian, travel writer and artist. She was the daughter of Francis Willoughby of Wollaton, Nottinghamshire, a Fellow of the Royal Society and a writer on natural history, and his wife Emma, the daughter of Sir Henry Barnard of Bridgnorth, Shropshire and London. When her 19-year-old brother Francis disagreed with his stepfather's handling of his finances, Cassandra accompanied him in 1687 to the Willoughby family's earlier seat, Wollaton Hall in Nottinghamshire: "This proposall [of her brother's] I was much delighted with, thinking it would be no small pleasure for me to be Mrs of Wollaton, and to doe whatever I had a mind to." She then oversaw restoration of the gardens and rebuilding of the house over a quarter of a century. In 1713, at the age of 43, Cassandra married her wealthy cousin, James Brydges FRS, at Chelsea College Chapel. She was his second wife. Brydges' social standing rose the following year when he was made Earl of Carnarvon and inherited a barony and baronetcy. When his father, the 8th Baron Chandos of Sudeley, died; in 1719 he became Duke of Chandos, and Cassandra the Duchess. The National Gallery of Canada has a portrait of Cassandra and her husband by Sir Godfrey Kneller dated 1713 which also features Brydges' two sons by his first wife. Cassandra died childless aged 65, and was buried at St Lawrence, Whitchurch near the ducal seat Cannons. Both the mother and sister of Jane Austen were named after Cassandra, to celebrate their link with a ducal family; Jane's mother was the granddaughter of the first Cassandra's sister-in-law, Mary Brydges. Writings: Before she married she compiled a history of her father's family she entitled The Continuation of the History of the Willoughby Family which is preserved in the Manuscripts Department at Nottingham University Library. Some of her correspondence from before and after her marriage has been preserved at the Shakespeare Birthplace Trust Record Office, at the North London Collegiate School and the Huntington Library and Art Gallery, in San Marino, California. In addition, there are travel writings and genealogies. Apparently New Orleans was flooded for six months in the winter of 1734 1735. See here. Six bottles of wine recovered from a ship that sank in 1735 have raised a total of more than $12,700 at auction in Belgium. More here. On this date (July 24) in 1735, a truculent indentured servant with a name like a primetime drama was hanged in York, Maine (at that time part of the Massachusetts colony), for killing her master’s grandson. 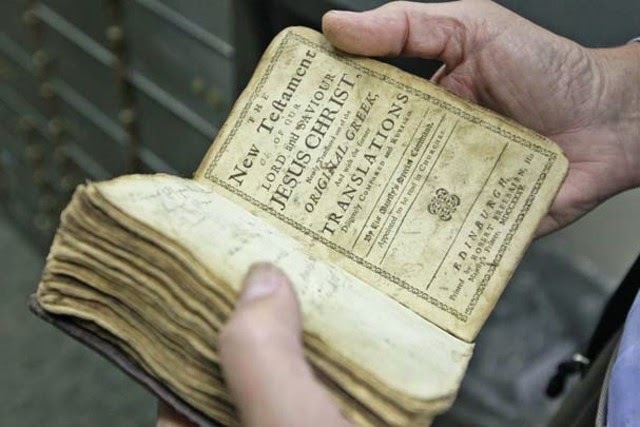 Roy Collier of Toccoa, Ga. flips through his family King James Version Holy Bible, printed in 1735, in a safety deposit box room at a bank. See here. 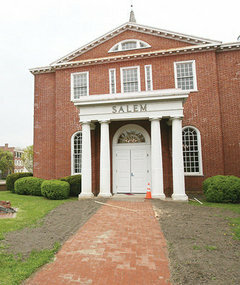 The original section of the Old Courthouse at the corner of Market Street and East Broadway in downtown Salem City, NJ, was built in 1735. Later additions were made which enlarged the building. Driving down Derby Street in Salem Massachusetts, it’s easy to miss this house. There are no signs along its fence that draw attention to it, nor is it part of the Salem Maritime National Historic Site. It sits off Derby Street at 27 Herbert St. Yet, this house and its occupants really were the catalyst for the development of this area that would later become the national historic site. The land and building on it dates back to the 17th century and attest to the continuing focus of Salem on the ocean and trade. There were house lots here in the mid 1600s with frame dwellings for a succession of mariners into the early 1700s. In 1713, John Gardner sold the property to John Langsford whose heirs sold what was then considered the Langford Estate consisting of a dwelling, bake house, shop and barn to James Lindell for £400 in 1734. He in turn sold the property to Captain Richard Derby in Sept 1735 for the same amount. Captain Richard Derby (1712 -1783) first captained a vessel in 1735 at the age of 24. That same year, he married Mary Hodges. 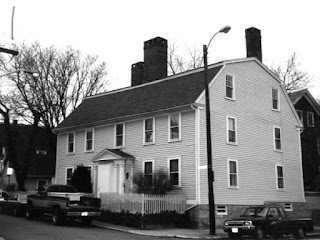 This house is believed to have been built in 1735-1736. It appears that he had the other buildings removed. Captain Derby added land to his house lot by lot, buying land from the Pickman family a few years later. Captain Derby continued to captain ships for the next 21 years. Having success on the seas, he allied with Timothy Orne during the 1740s, in an effort to increase his wealth through maritime investment. More here. It's for that sort of info I strive. How old were they in 1735?